Professional Remodeler’s 2005 Best of the West Design awards recognize design, quality construction and exceptional value in remodeling projects. 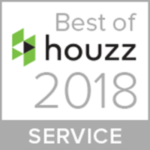 Projects were judged with five criteria: aesthetic and visual appeal; value delivered for the price; quality of workmanship; space planning and functionality; and how well problems were solved and challenges met. Below is featured Powell Construction’s winning project from start to finish. Send out the dinner invitations, center stage is ready! 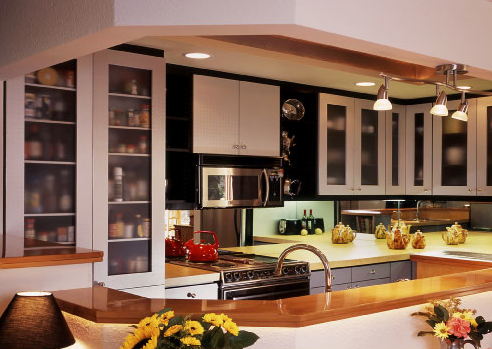 The variety of matte and reflective surfaces all come together in this stylish new kitchen! (Photo 1 above) From the polished mirrored backsplash and framed custom glass doors, to the metallic and matte cabinet faces, and the contrasting slate and marble flooring— these surfaces shine in a multi-layered lighting scheme. Sophistication and the overall feel of this kitchen remodel were foremost on the homeowner’s list of priorities. Reflected in the design is the client’s desire to avoid anything predictable, opting instead for a bold, dramatic statement. She is delighted by this European-style design that has a hint of retro. The homeowner wanted the new kitchen to be connected to the entertaining areas, yet, not completely open. This required special consideration of spatial transitions. 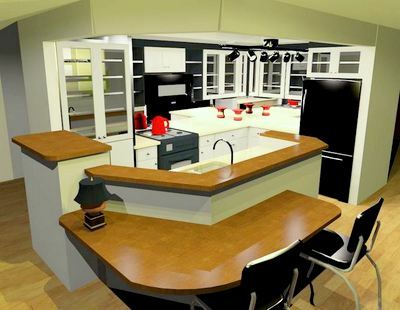 We used a tray ceiling and soffit to define and separate the kitchen. A custom cantilevered eating bar connected the kitchen to the living space of the home. The ceiling was particularly complicated because the existing ceiling joists had to be supported where the steps of the tray changed elevation (Plan CS.) Removing the walls and header would have necessitated a post near the bar to support the ceiling. 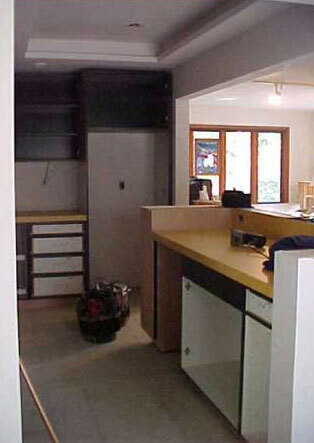 However, the homeowner wanted the eating bar to appear to float and thought a post would be visually disruptive. In order to support the load without a post, a Glulam beam was maneuvered into the attic to carry the load out of sight. 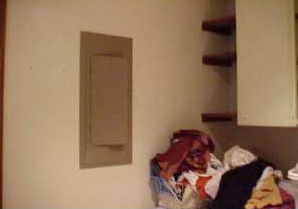 Another complicating factor was the main electrical panel, which was located in the former laundry room on a wall that was removed for the remodel. All the wiring in the house had to be moved to the newly relocated panel. While meeting our client’s concern of aesthetics, our Design/Build team also carefully considered increasing the new kitchen’s functionality. 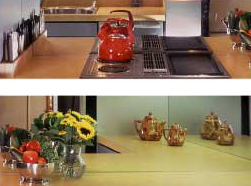 Bold yellow laminate countertops punctuated the neutral palette and increased food preparation and cooking areas. 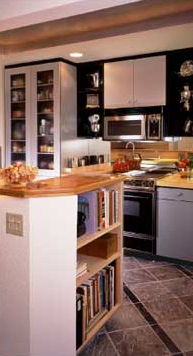 Varying the heights of the counter tops, wall caps, and eating bar buffered the cooking zones from guests; provided more serving space for entertaining; and allowed special built-ins such as a bookshelf for cookbooks, and a custom knife block. 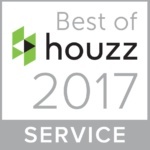 New elements included highly efficient, state-of-the-art stainless steel appliances; increased prep surfaces; and greater storage. One drawback of the kitchen’s new location was the lack of access to exterior walls for windows. 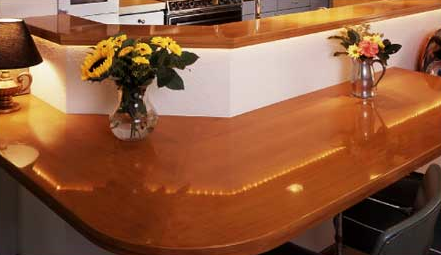 To overcome this, we varied the intensity of reflective surfaces including a mirrored backsplash. This enhanced the sleek contemporary look of the room; created a feeling of spaciousness; and reflected natural light from opposing windows. The unique use of recessed and concealed lighting outlined the tray ceiling and added ambiance to the area. Our decision to integrate modern and engineered products with organic materials created visual interest and a desire to feel the textures. Carefully positioned lighting accented sleek cabinets and natural elements such as maple, slate and marble to add rich warmth and a connection to the outdoors. Our attention to such details generated a modern, streamlined design that avoids being cold or sterile. From lackluster to luxurious, this sophisticated kitchen makes a stylish statement that is at the same time functional and inviting. Our client is thrilled with the end product. The drab kitchen photoed here was the motivation for remodeling. It had dated 1970’s cabinets and counters and no redeeming features as it sat in the back of the house. 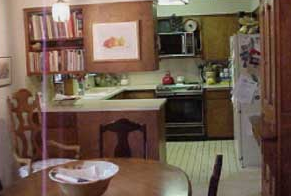 Peninsulas with hanging cabinets were once popular, but closed in the kitchen and the chef. Today’s homeowners want to be connected to their families and guests while cooking. A prior remodel converted a garage into this family room. 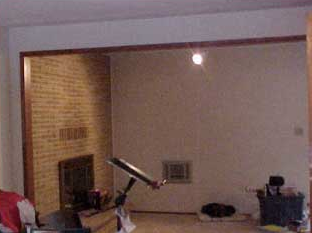 The load bearing wall from the garage was replaced with a header, pictured here in the opening between the fireplace area and the family room. To creatively support this load out of sight, we removed some of the siding on the house and hoisted a 5¼ Glulam beam into the attic above the rafters. 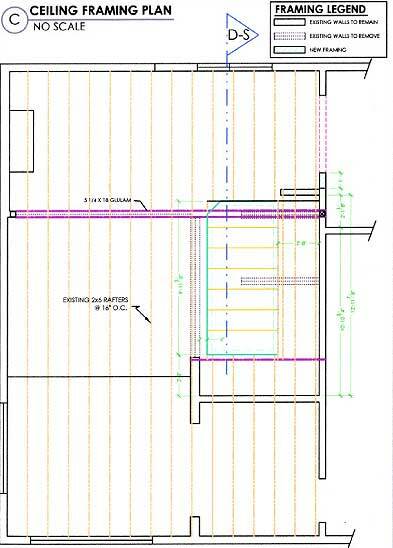 As you can see in Plans C and D, the framing of this ceiling was very complex. This wall and main electrical panel (photo below) occupied valuable space needed for our new kitchen design (new photo below). The entire wall was removed and the wiring relocated to a new panel. The end result made the effort put forth on this ceiling is all worthwhile. The precision necessary to craft the tray ceiling was tricky. Everything from the thickness of the drywall, diameter of the rope light, and color of paint to be reflected were all considered. 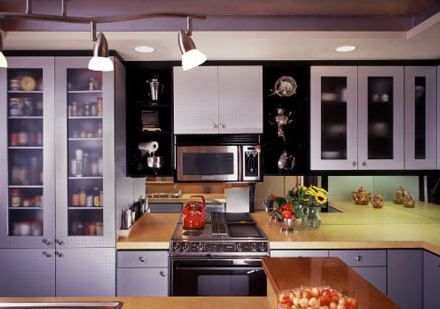 Adjustable modern track lighting was added to strengthen the kitchen’s retro feel. It also highlighted the owner’s collection of vintage cookware. Roped and recessed lights offered ambience to the room. 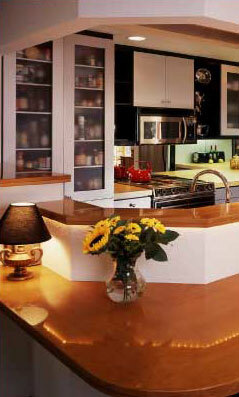 Under-the-cabinet task lighting became a practical option for everyday chores. The microwave and hood combination provides more workspace and an is less obtrusive than a large ventilation hood. This supporting bracket (below left) helps the eating bar below appear to float. 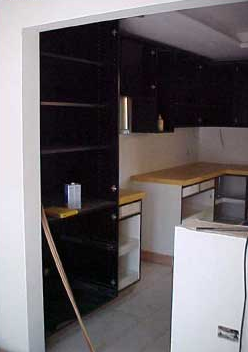 The interior upper cabinets and open shelves were finished with black melamine for easy cleaning and drama. A high counter encases this slick Franke Prestige Classic Plus stainless steel sink to keep all dishes out of sight. Its features include. . .
a convenient air switch to operate the garbage disposal. 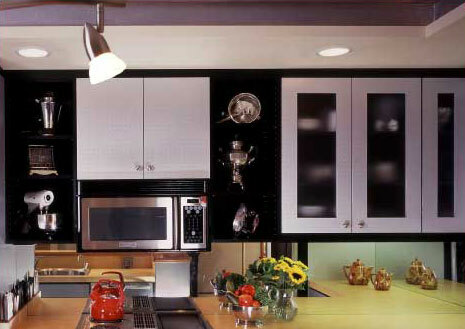 Upper cabinets are custom fitted with Matte Lux Annealed glass doors allowing its contents to add to the room’s decor. 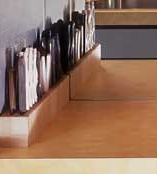 Shelves mounted to the inside of these doors create more usable space inside. The glass doors are a great compromise between open and concealed storage. The look is clean and uncluttered, adding to the room’s appealing modern feel. The reflective raised surface of the laminate door frames (Formica Decor Small Rivet #2063) reflect light and added texture and depth. 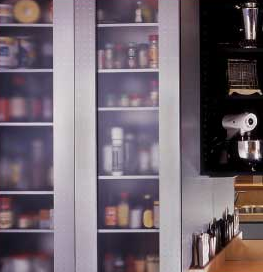 In contrast, the lower cabinet doors are finsihed with with a matte gray laminate (Nevermar mxt-0037) for balance. Satin nickel knobs continue the room’s reflective qualities and complement the stainless steel sink and appliances. Custom crafted shelves (Photo below) are strategically placed to screen the view from the family room sofa and provide convenient storage for cookbooks. Natural slate flooring is accented with polished marble to continue the contrast between textures as well as reflective and matte finishes. 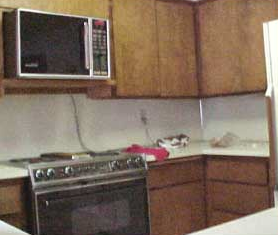 The mirrored backsplash (photos above) mandated the electrical outlets, per code, be placed elsewhere. Our solution was to mount electrical plug strips behind the light bar on the upper cabinets. 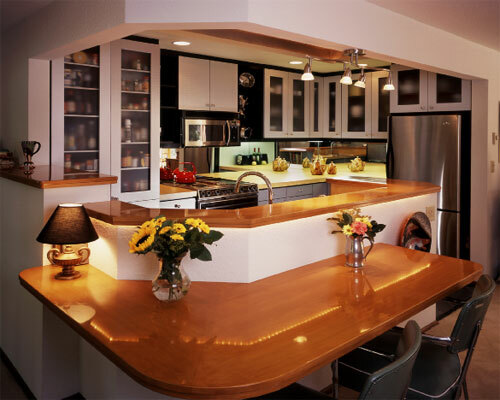 The angle of the mirrored backsplash was carefully considered to prevent their reflection. 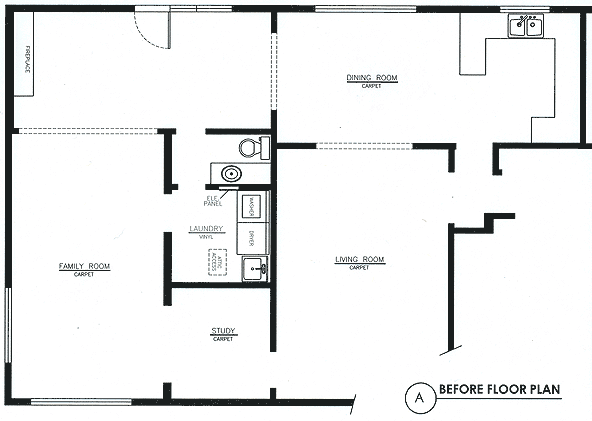 What about the laundry room? Since our new kitchen design utilized the old laundry room, we used the previous kitchen space to create a more versatile utility room. A beautiful solid wood Anderson door allows direct access to the outside. 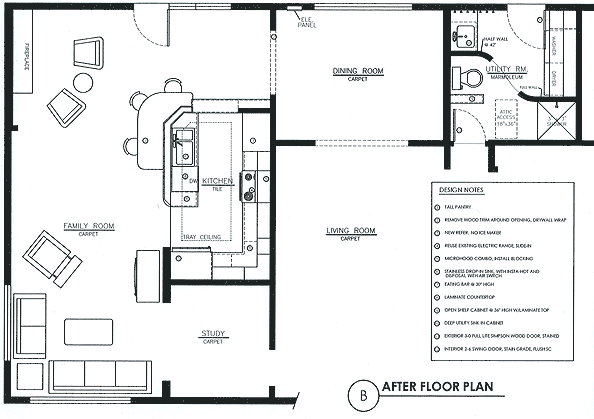 The room’s ideal location offers a transitional space between outdoor and indoor activities. Muddy boots and wet coats, so prevalent in Oregon, can be shed without being tracked into the home’s main living areas. After gardening, the homeowner can simply shower and launder gardening gear at the same time. Our designer chose Marmoleum flooring by Armstrong (photo 17 below left) for its durable and easy to clean surface as well as its design capabilities. A green product made from natural materials, it is bacteriostatic, biodegradable, and warm to the touch. 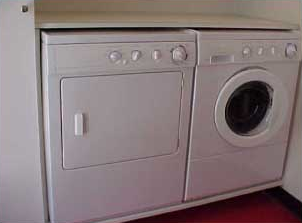 It can also withstand harsh assaults from water and grime. 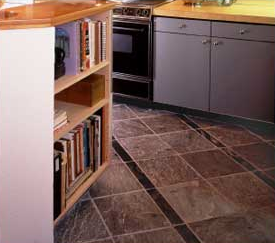 A curvilinear wall and floor imitate the artistic curves of the kitchen. 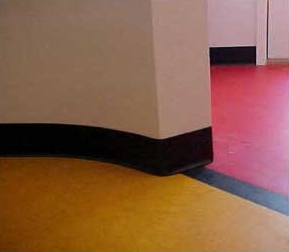 Here, Marmoleum’s flexibility simplified installation around the curves. Marmoleum’s extensive colors and patterns allowed us to continue the contemporary, bold look of the kitchen. Although utilitarian, this room has flair! Marmolueum’s vivid red and yellow colors (photo above) add warmth and drama to an area that could otherwise be dull and boring. A during shot (photo right) was taken from the same angle seen in the finished project (photo above). Since the curved wall was only 42″ high and would not reach the ceiling for support, metal strapping was needed for stability. 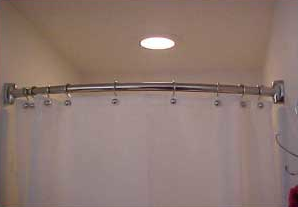 The cute shower pictured above features a curved curtain rod to complement the linear walls and to add extra space while bathing. 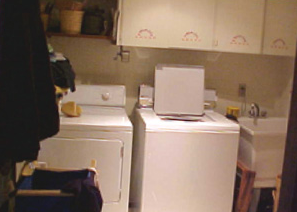 The Frigidaire front loading washer and dryer are built in 6″ off the floor height for easier access. The countertop above is removable for servicing the machines.